Intuitive eating has radically changed my life. This is no exaggeration. It has changed the lives of several of my clients. This is also not an exaggeration. If you often worry about food and your body, intuitive eating frees you from this obsessive thinking and any compulsive behaviors. It’s truly a liberating process, but what exactly is it? In this article you will learn about intuitive eating basics and how to become an intuitive eater. Intuitive eating is a non-diet, process-based approach that teaches you how to have a healthy relationship with food and your body. It is for everyone regardless of body size and chronic health conditions, including (but not limited to) diabetes and heart disease. It is comprised of 10 principles that bring together the mind and body, and help you become more attuned to your needs. You learn to remove external rules, guilt, and morality from eating, and instead connect with internal signals, such as hunger, fullness, and satisfaction. Connecting to these physical sensations, and observing how a food makes you feel physically and emotionally, all provide you with information to guide future food choices. By tapping into your inner body wisdom, you have the freedom to nourish yourself as you see fit. Feelings of self-worth and self-respect increase from the act of giving your body exactly what it wants and needs. Why should you become an intuitive eater? Research has shown intuitive eating supports long-term health while reducing overeating, food and body preoccupation and harmful dieting behaviors. 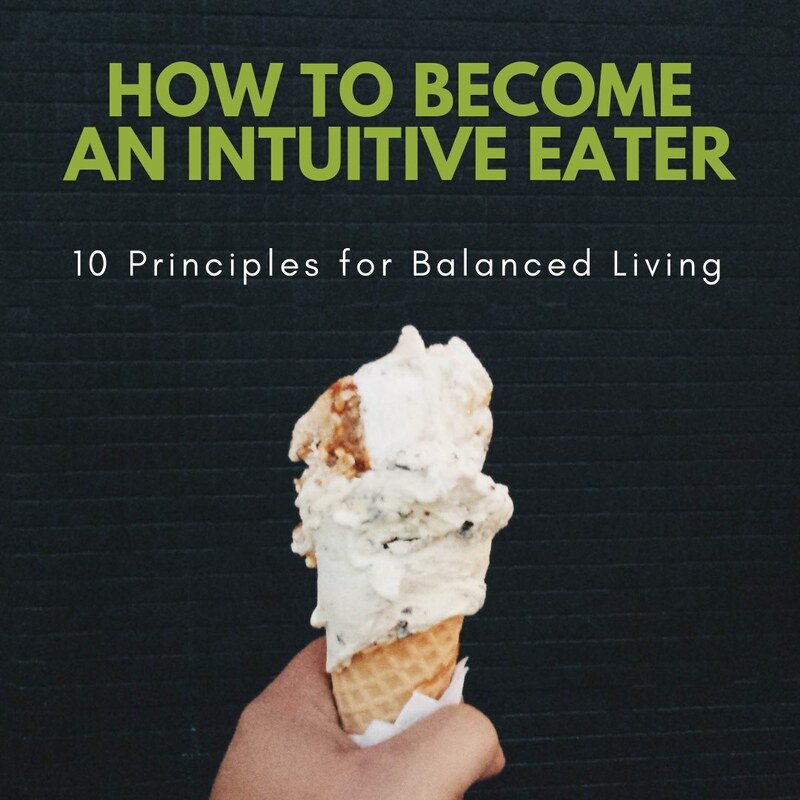 Intuitive eaters report less disordered and emotional eating, higher self-esteem, a varied diet, improved cholesterol, lower blood pressure, stable blood sugar levels, more body acceptance, and proactive coping skills. Intuitive eaters are motivated to exercise regularly because they discover physical activity that is both joyful and invigorating. If you embrace intuitive eating, you will also reach a weight that is healthy for your body and is easy to maintain because you are not restricting your food intake or overexercising. What steps can you take to become an intuitive eater? By embracing the ten principles below, you will start your journey towards becoming an intuitive eater. Intuitive eating is not another diet. The principles are gentle guidelines that get you to a more comfortable place with food and your body, and should not be embraced as rigid rules. Intuitive eating is inherently a fluid process that is unique to you and your needs, so there is no correct way of doing it. There is no specific order for tackling the principles, except for #10, which encourages the use of gentle nutrition information to guide your food choices. This is the last principle to address. Putting too much emphasis on healthy choices early in the intuitive eating process can make it difficult to discover your food preferences and objectively observing their effect on your body. Start where you feel most comfortable, though I find #1 to be the best place to begin your journey. Anger can be a useful ally, and you will see why. Get rid of any book or articles that give you false hope of losing weight for good. Write down all the food rules and beliefs you have and start to challenge them. Get angry with diet culture, which has told you that your body is a problem to be fixed and diets and restriction are the solutions. Get angry with diet culture for making you feel bad for craving sugar, eating carbs and having a reductionist view of food as medicine. Reject the dieting mentality which has made you feel like a failure after you regained all the weight you lost. By rejecting it, you give yourself the space to reconnect with your inner intuitive eater. This is the first step in building trust with food. Feed your body when it is biologically hungry. Provide it with adequate energy and carbohydrates to avoid triggering the primal urge to overeat. Avoid waiting too long to eat because, with excessive hunger, moderate and intentional eating becomes difficult. Give yourself unconditional permission to eat all foods. You will feel deprived if you tell yourself you cannot have a certain food, especially if you actually want it. This deprivation will likely lead to intense cravings, and if you encounter the food, you may overeat it and feel guilty. When you give yourself permission to eat all foods, the urgency to overeat decreases because your body knows that food will never again be restricted. The Food Police is that annoying voice that monitors all your food choices. It judges whether you are being “good” or “bad” based on whatever food beliefs and rules are deeply ingrained in your psyche. When you break a rule, the Food Police makes you feel shame and guilt. Get angry and scream “hell no” when you hear this voice, and learn to challenge its unreasonable laws. This is critical to becoming an intuitive eater. Get to know your body’s signals that tell you it’s no longer hungry, that you are comfortably full. Practice conscious eating by pausing in the middle of eating a meal or snack to ask yourself: How does the food taste? What is my current fullness level? When you finish eating, rate your level of fullness so you can get to know your last-bite threshold. Pleasure is rarely talked about in the dieting world, and is often denied. Healthy living should include pleasure and satisfaction in the eating experience. When you eat foods that are satisfying and pleasurable, you are less likely to overeat. Less food is needed to feel content and satisfied. Food will not fix your feelings and will not solve your problems. Yes, food can be comforting in the moment, but its soothing effects are fleeting. If you only calm emotional hunger with food, you may feel worse in the long-term. Learn ways to soothe, distract and resolve emotions without food. Identify the underlying emotion and trigger and find alternate ways to cope. Accept your genetic blueprint. Just as everyone has different shoe sizes, bodies come in different shapes. If you are overly critical of your body and unrealistic about what it should look like, intuitive eating becomes a lot harder. Learn to respect your body so you can feel better about who you are regardless of your shape. Instead of focusing on how many calories an exercise expends, shift your focus to how good it feels to move your body. If the only purpose of exercise is to lose weight, exercise efforts are often only temporary. If you focus on how exercise makes you feel, you are more likely to be motivated to workout and make exercise a regular part of your self-care regimen. Make food choices that honor your inner values, health and taste buds, while making you feel physically and emotionally good. To be healthy, you do not need a perfect diet. What you eat over time matters more. Nutrient deficiencies or weight gain do not occur after one meal or one day of eating. Learn to value progress, not perfection. Intuitive eating is a process and a journey, meaning it will not happen overnight. There will be will be bumps along the way, but unlike a diet, mistakes are wonderful learning opportunities that offer you insights into yourself, your coping mechanisms and eating patterns. It’s possible to undertake this journey on your own, but if you’re in need of a buddy, I am happy to show you how to become an intuitive eater. Intuitive eating packages can be found here. If you have any questions or comments, feel free to leave them below or email me directly.